Get affordable Security Camera installation on Santa Ana, CA and CCTV equipment with commercial quality and 2 years warranty. Sometimes the customers have some legal concerns about the recording of video and audio through security camera system. In general, most video recordings are legal when you try to protect your property, if the security camera system was installed in your business, your employees has to know that you have a system. You may post some warnings or CCTV stickers inside and out of the facility. The main concern about installing a security camera system is privacy. If you have neighbors you have to be sure that their privacy isn’t invaded. Audio recording is only legal with consent of one or all parties. Always check the city laws before install a security camera system to be sure that is legal where you live. When Protection4less install a security camera system always try to get best angle of the cameras to cover the property and avoid privacy concerns of the neighbors. The other concern of the customers is to get the right system with the right price. Protection4less will give you the best price; the skilled technicians will give you the best professional installation. 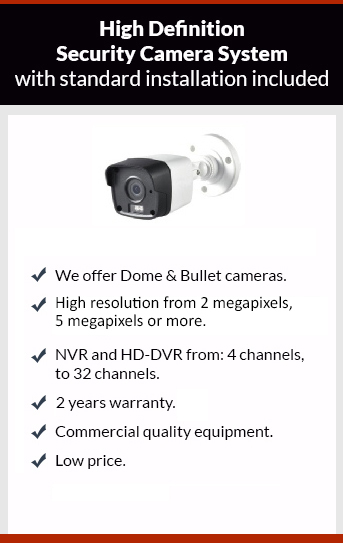 We choose the right CCTV technology to adapt our systems to your needs. Give a call to Protection4less, the estimates are free.